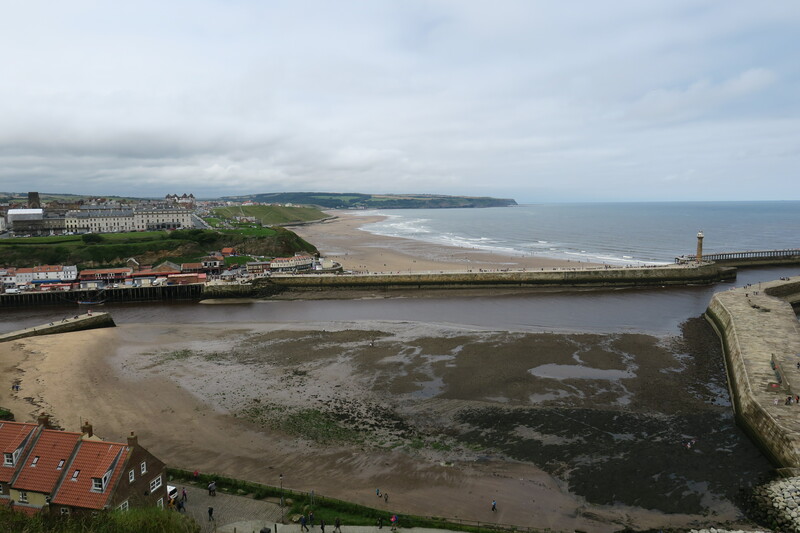 A wonderful childhood holiday in Whitby left me wanting to return someday. Until this summer we never did, so on the morning of our planned day trip there I was excited. 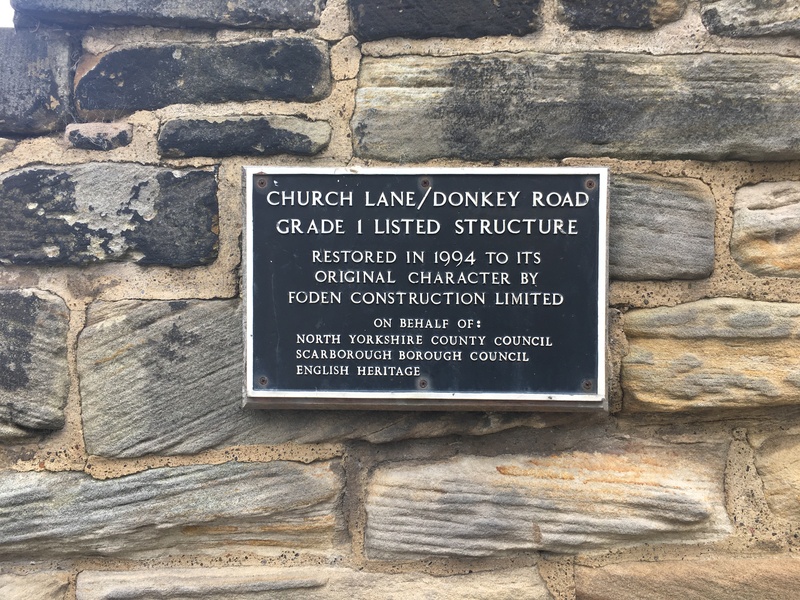 Just 11 miles and 20 minutes easy drive from our Staithes base, the weather was overcast and misty on arrival but the odd bit of blue sky here and there was a vast improvement on previous days. 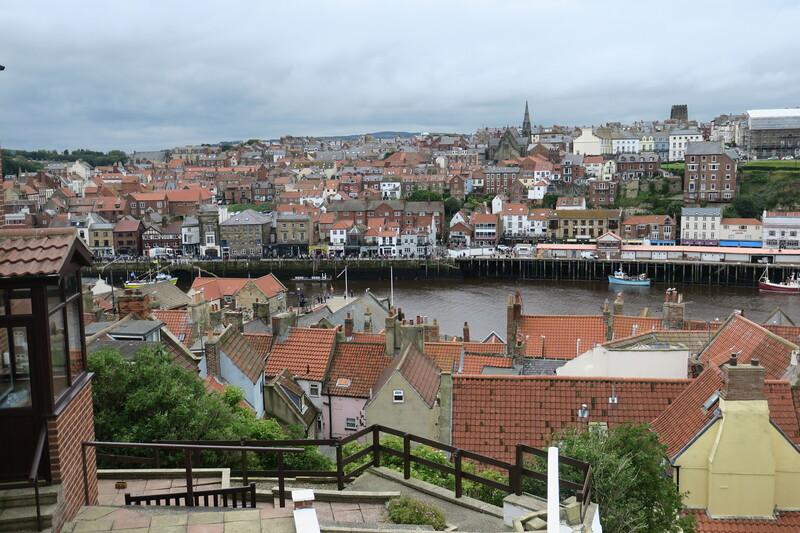 I was instantly struck by how busy and buzzing Whitby was – lots of people and loads going on. 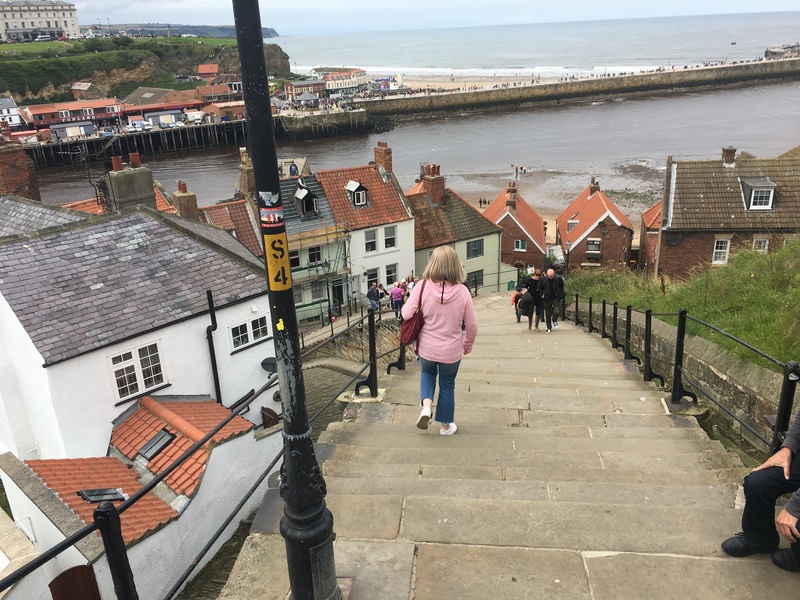 A significant tourist draw thanks to its association with a certain Transylvanian count, Whitby is famed for being the inspiration for Bram Stoker’s Dracula. 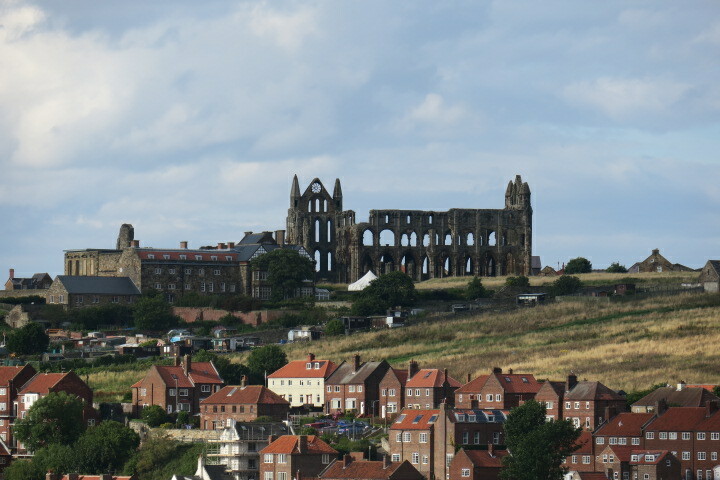 Stoker spent his summer holiday here in 1890 and at Whitby Library discovered the name for his vampire. In the story Dracula enters England after his ship crashes into Whitby’s pier. 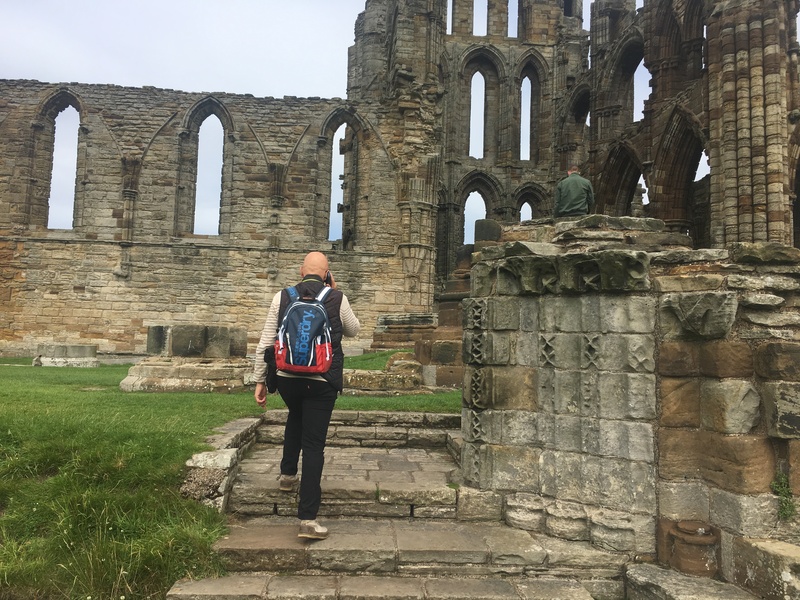 He runs up the steps to Whitby Abbey, described in the book as “a most noble ruin, of immense size and full of beautiful and romantic bits.” That was where we went first. 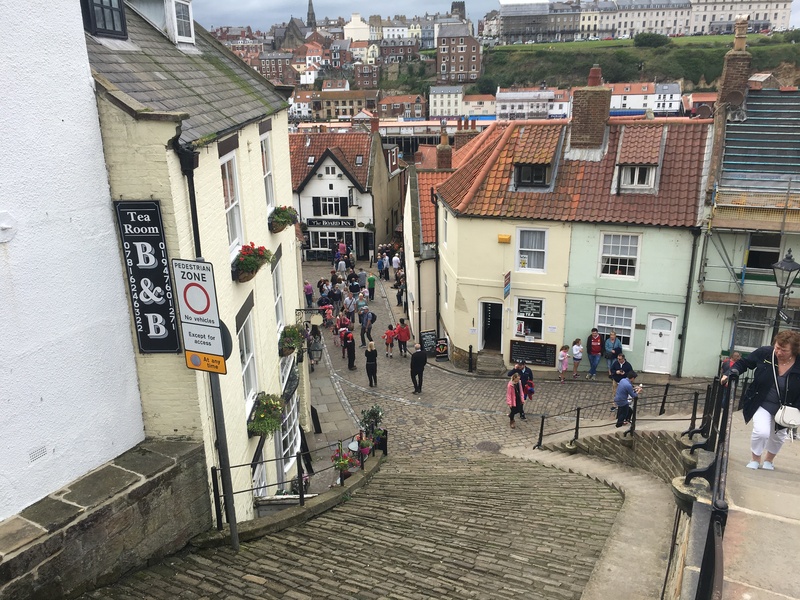 The Abbey is perched on a cliff high above the town and a set of 199 steps (the very ones in the story) take you all the way to the top. 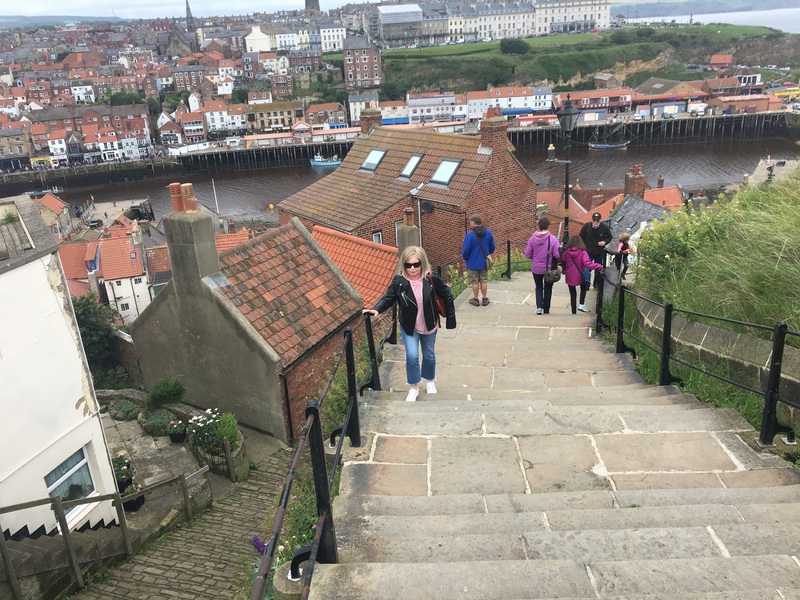 Despite the sign warning of caution the climb up is fairly easy, if you did need to stop and take a moment the views back down over Whitby are superb. The steps start amongst the shops and clamber up the hillside revealing a maze of higgledy piggledy red roofed houses. I read somewhere it is traditional to count the steps as you go up. Husband and I did this but ended up each with a different number neither of which was 199. Beside the steps runs the Donkey Road which also goes all the way to the top. Right at the top is St Mary’s Church as lovely inside as out. 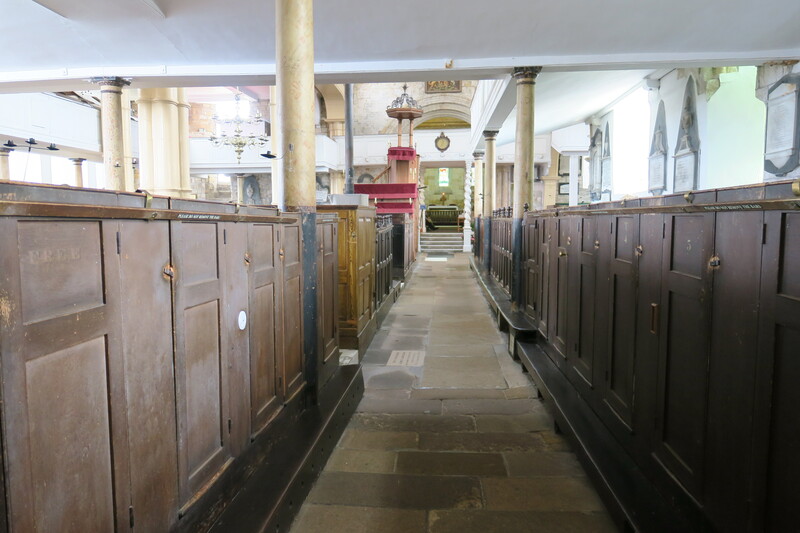 It has unusual box pews, a triple decker pulpit and a very old chest with a fascinating story. 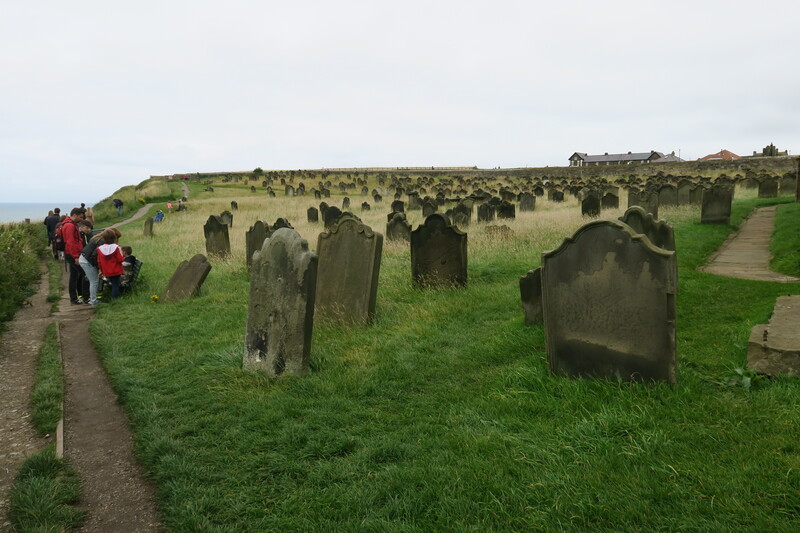 Outside is a graveyard full of crooked grave stones – you could just imagine Dracula prowling around here. 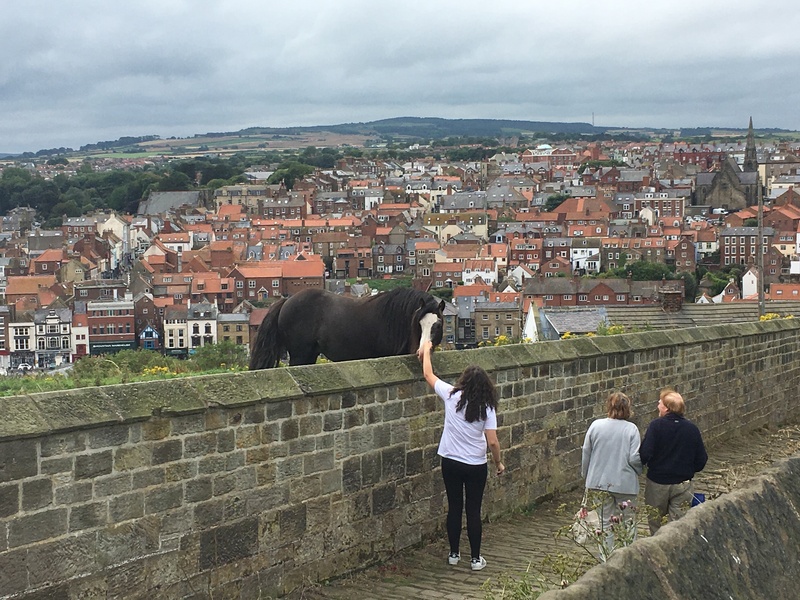 The views over the town, the sea and across to the Abbey are gorgeous. It was a popular place for picnicking too, all benches taken when we arrived but when one became free we grabbed it and ate our sandwiches looking out over the sea. 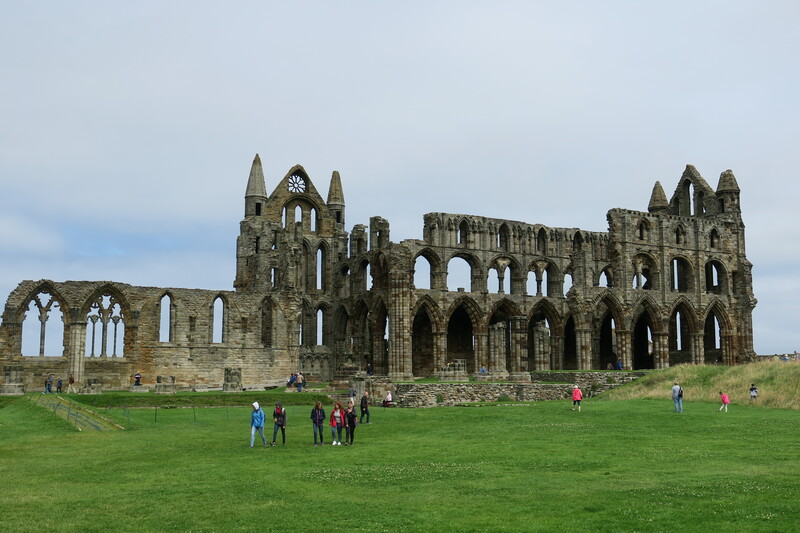 Whitby Abbey is just a stone’s throw from the church. 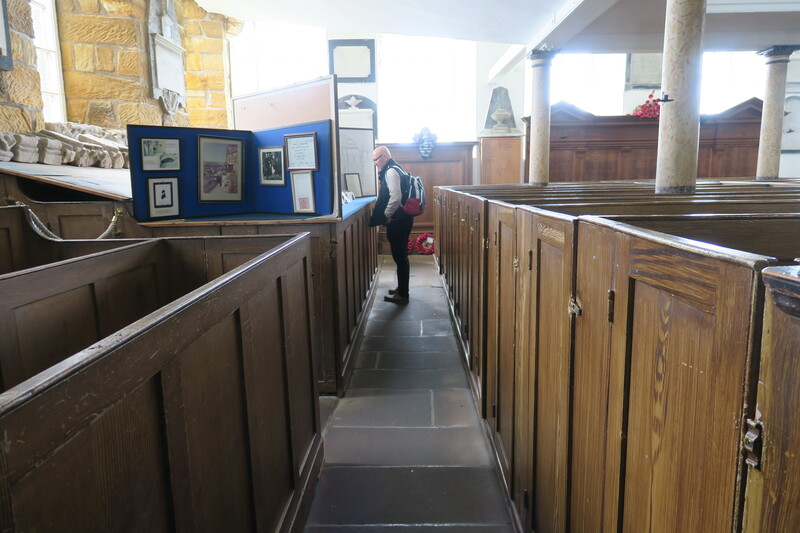 An English Heritage attraction meant free entry for us as members. It was extremely busy that day, initially we were told they had run out of audio guides, but we had a look at their exhibition and hung around for 20 minutes and some more became available. 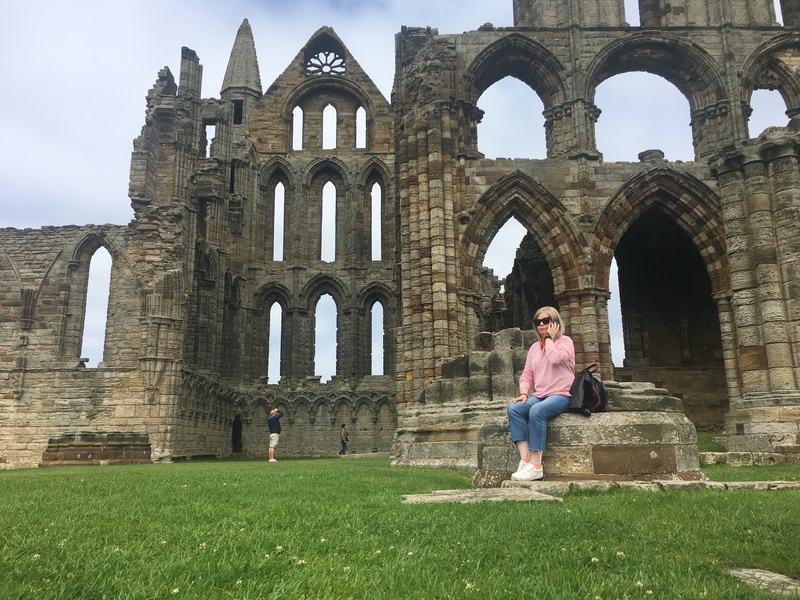 The 13th century gothic abbey ruins are splendid and strolling around listening to your audio guide tell the story of this place makes for a wonderful walk. The Abbey was a 7th century Christian monastery that later became a Benedictine Abbey. It was once one of the most important religious centres in the Anglo Saxon world ruled over by a formidable Abbess – Hild. Back down the steps afterwards meant another chance to take in those views. At the bottom we found the cutest little cafe full of Dracula and vampire references. We couldn’t resist going in for a drink. 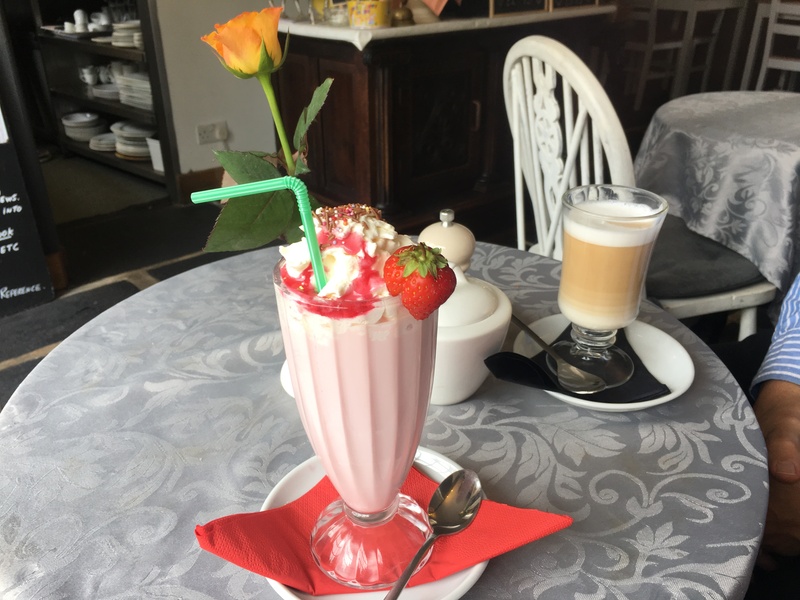 A raspberry milkshake and slice of Victoria sponge was just the thing to set us up for the rest of the day in Whitby. I’m so glad we finally got to go back there – I loved it just as much as I remembered!! 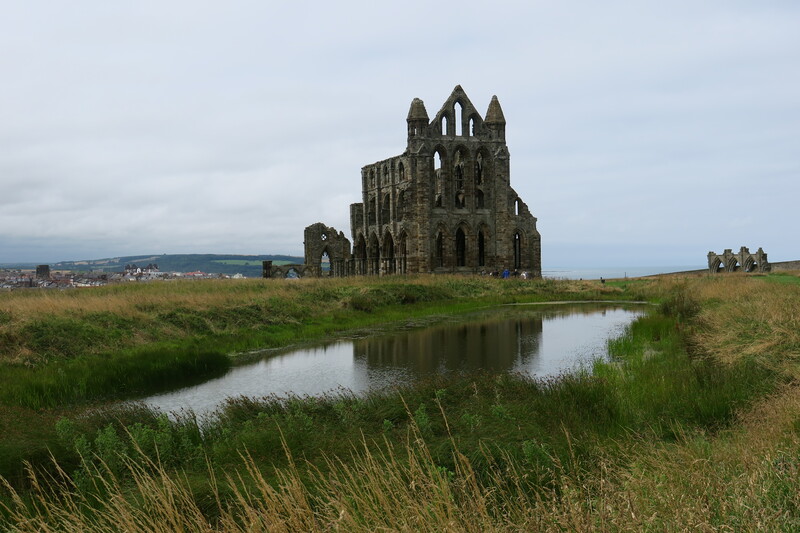 Whitby Abbey is wonderful. Even without the Dracula association, it has a lot of drama and gothic charm. I love the way it sits on the cliff above the layers of other buildings. I was last there when I was pregnant with my youngest and just a few weeks away (though I didn’t know it) from his birth. I thought the walk up was going to be taxing but it’s actually pretty easy and it’s worth stopping for a breather just to take in those views. We picnicked in the cemetery too and I told the boys an abridged version of Dracula while we ate. Lots of happy memories. It really is a breath-taking location and I found it so atmospheric just wandering around the ruins. You did well to walk up those steps Laura considering you were close to giving birth!! 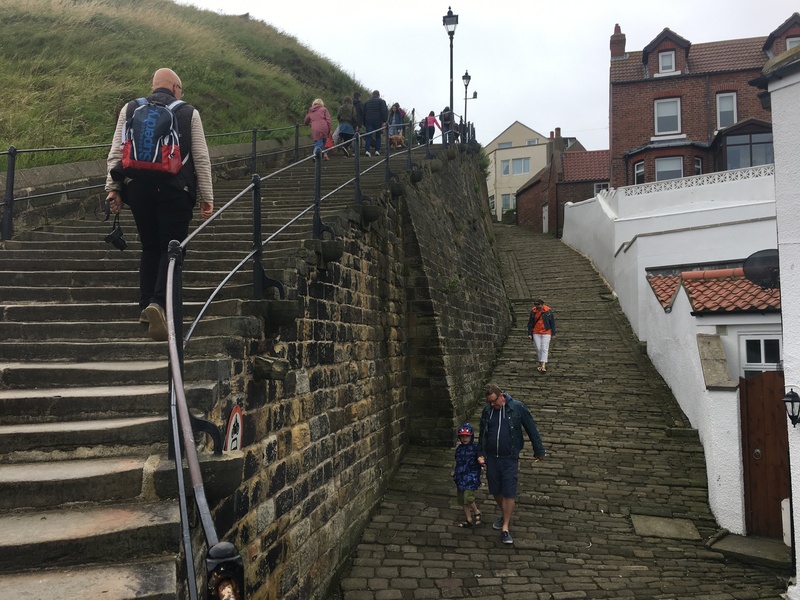 It’s funny, someone mentioned in an earlier post about walking up the Whitby steps and giving birth (unexpectedly) to her son the very next day!! Maybe there’s something about that climb. Glad to bring back good memories too. Thanks for the post. I read Dracula just a few years ago. Now I understand the inspiration for the book of this Abbey. 🙂 Happy travels. Whitby certainly make the most of the Dracula connection!! It was great wandering around the ruins and thinking about the story. It looks very inspiring to me. We visited last year, also for the first time in years. It’s beautiful, and – as you say – so busy. However, not so many people seemed to be climbing to the abbey so we didn’t have the problem of waiting for audioguides. Your weather* has improved drastically! *Glad I glanced over this before posting. Not sure what typo I made, but autocorrect turned weather into wet hair…… It gets more and more bizarre! Ha ha Anabel – that really did make me laugh!!! My husband is the king of sending autocorrect messages without reading them carefully and he has had some hilarious ones!! 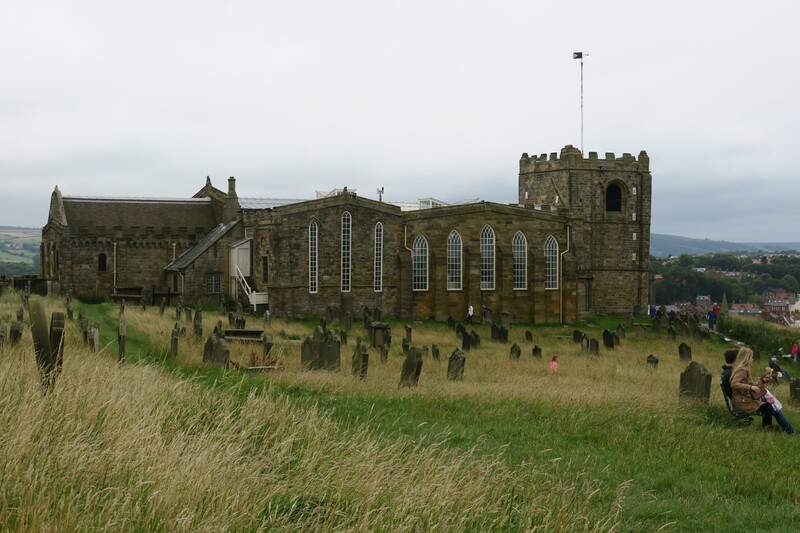 We loved Whitby and the Abbey and yes, the weather improved that day – it got worse again though before it got better!! I did!! Wet and windswept – the auto correct got it spot on. 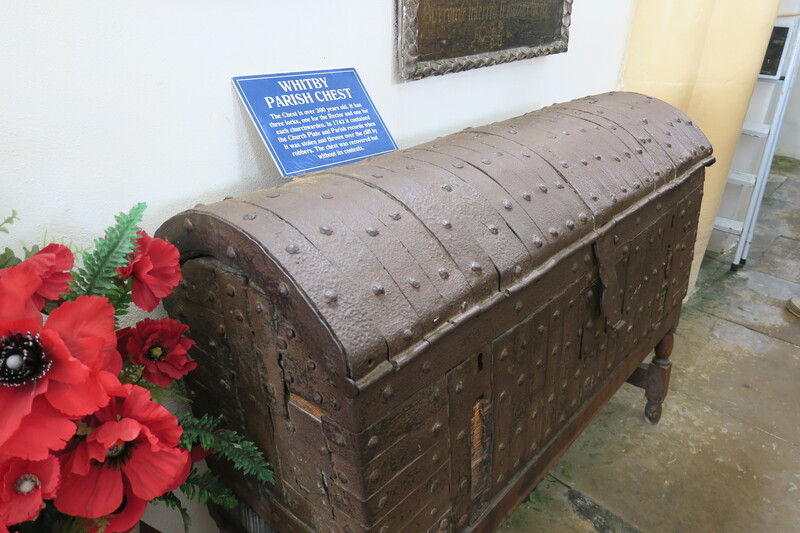 I was so pleased that you had better weather for your visit to the abbey and your photos are really nice. I can’t believe how my husband suggested climbing all those steps with a three year old and our Westie. I’ve just shown this to younger son, explaining how he was nearly born here! It’s about time I returned ! Hope you are having a good weekend. 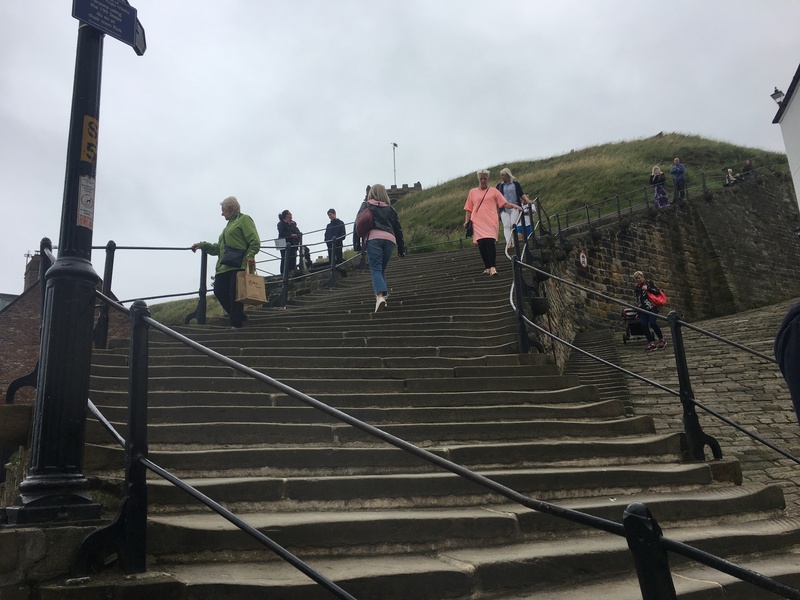 Someone else commented that they climbed the steps heavily pregnant and gave birth shortly afterwards – though not the next day Marion!! It is quite a story, I love it!! The ruins are so atmospheric and you can imagine how Stoker would have been inspired by this place for sure!! The cafe at the bottom was superb and as close to Dracula as I wanted to get!! 🙂 I would feel the same way. Love Whitby! So nice to see your trip to that part of England I’ve been to so many times. I remembered it from my childhood holiday and always hankered to go back. It didn’t disappoint and I loved it just as much this time around!! I just loved it on this visit as much as I remembered loving it as a child Rosemary. 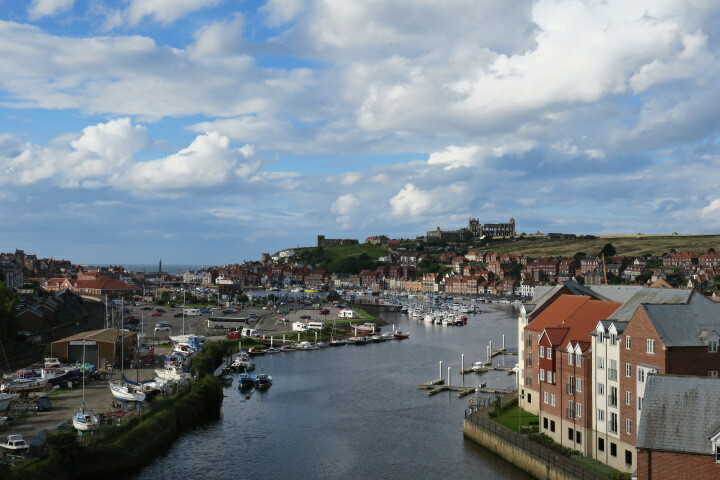 There’s something very special about Whitby and I hope we go back in the not too distant future and bring our son this time – I think he’d love it too. 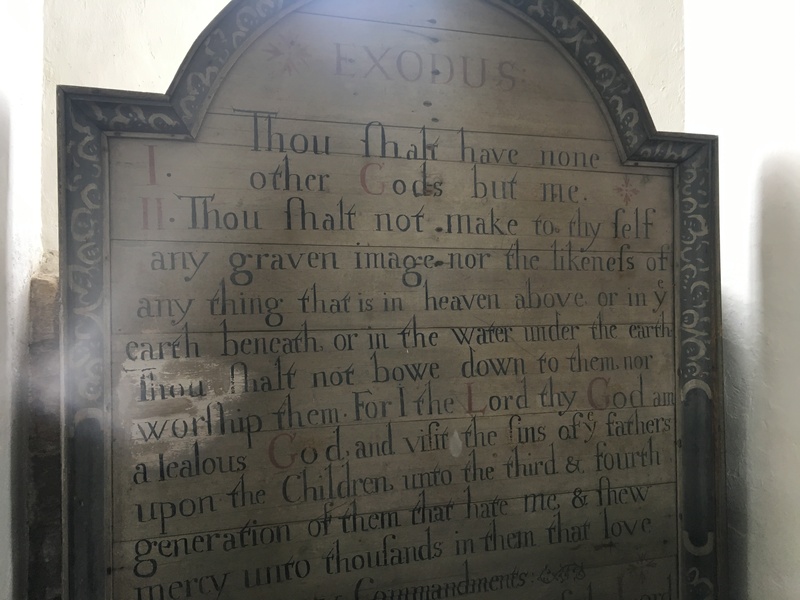 Gravestones in old graveyards fascinate me, I love reading them too and could spend hours doing that. 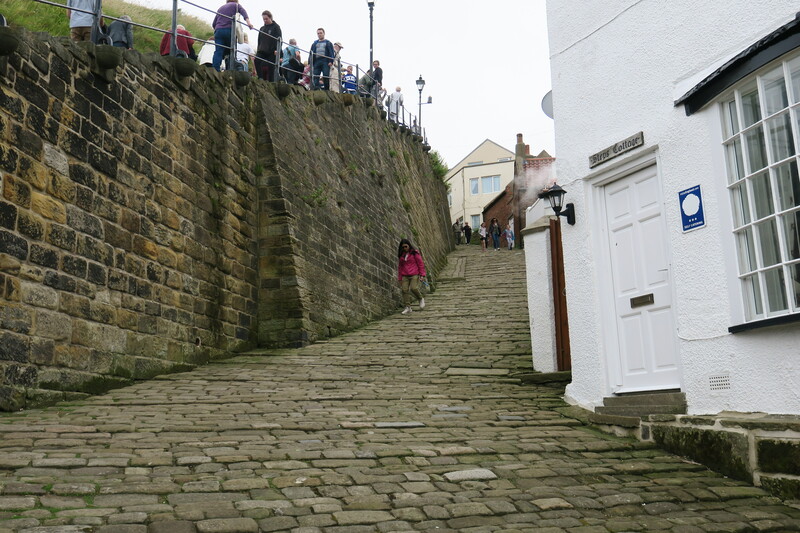 I really enjoyed the climb up the steps too and getting that different view over the town. We’ve had a very lazy weekend, definitely autumnal weather here now!! Hope your weekend is going well too. So sorry to hear that Rosemary, a very difficult and heartbreaking time. Sending you love and best wishes with the travel arrangements and for your time back here. 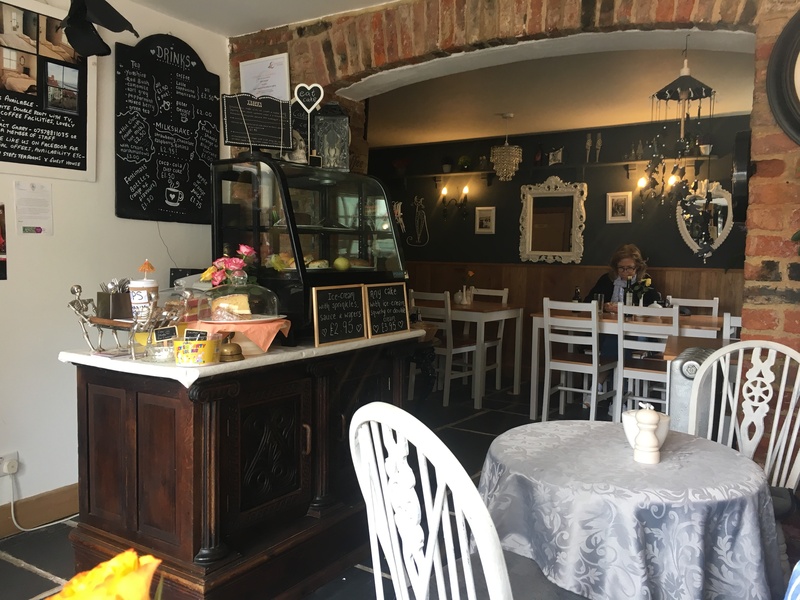 Thanks Joy – it is certainly a horrible time trying to work out travel arrangements and not knowing quite when to come over. Will put some plans in place tomorrow and get prepared. Better go and get some sleep now it’s very late over here! What spectacular ruins! One more place to add to my travel wishlist! It is a very special place, full of atmosphere, history and then Dracula too!! 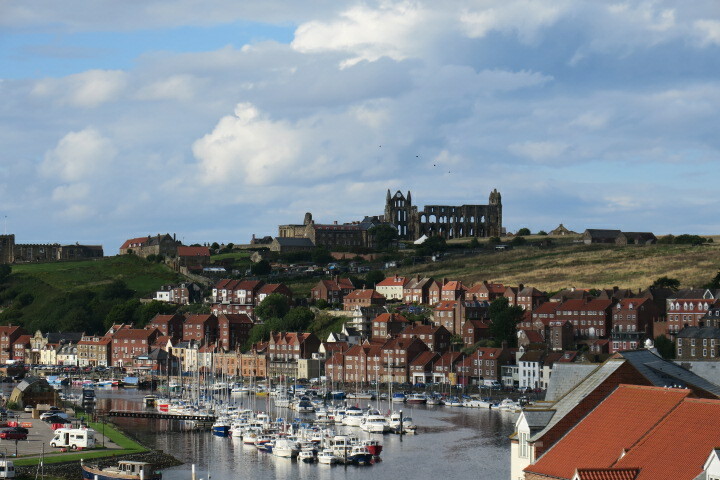 Whitby, seems like an amazing place to plan a visit, beautiful images.. 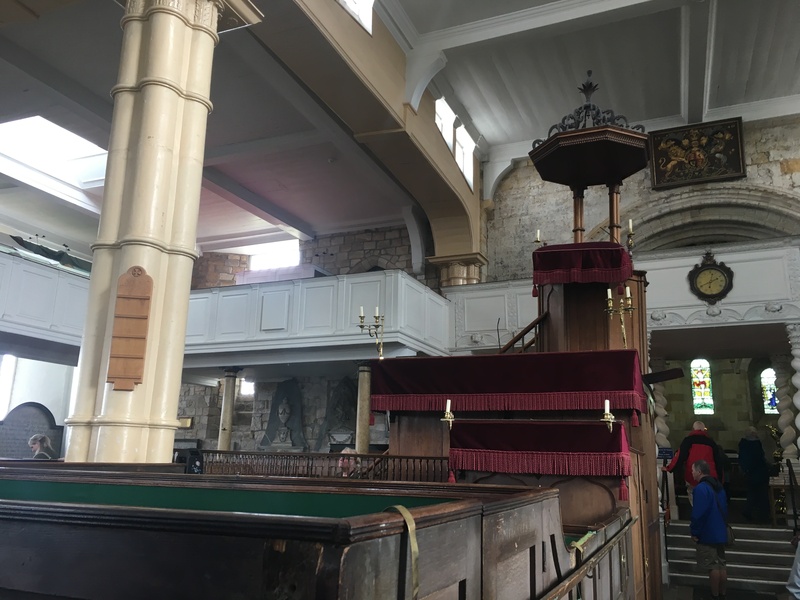 Thank you – it is a lovely town with so much to see and do. It is a stunning location and a great place to explore. The weather did improve…. for a short while!! 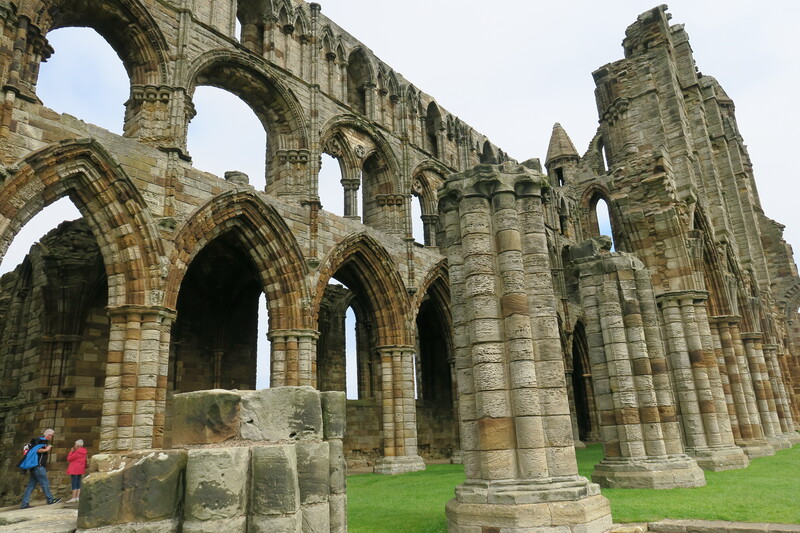 The Whitby Abbey ruin is beautiful. This sounds like a fascinating place to visit! I enjoyed climbing those 199?? steps with you! Thank you Pam!! Climbing up the steps to get there somehow adds to the anticipation and excitement of visiting the Abbey! I love your pics. You’ve captured the character of the town well! Thank you!! It is a gorgeous little town to explore and photograph. 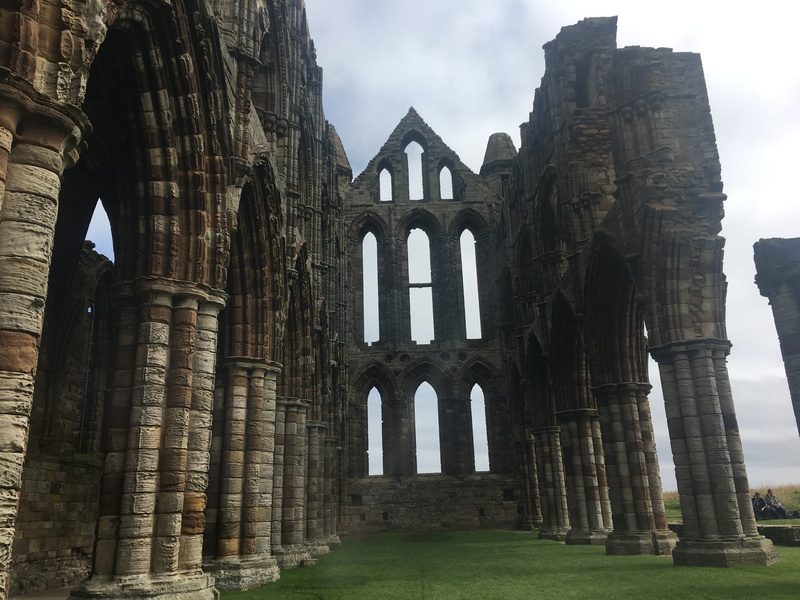 Wow, Whitby Abbey looks stunning. And I totally know what you mean by wanting to go back to revisit childhood memories – I love taking my girls to places that meant so much to me as a kid. I just really hankered to go back here as I had such lovely memories – it didn’t disappoint! Oh I love the gothic gloom of the Abbey. I read Dracula many years ago but had no idea that is where Bram Stoker got his inspiration from! It is so atmospheric and beautiful, you can really see how it would inspire someone to write.